Any other chocolate lovers out there? 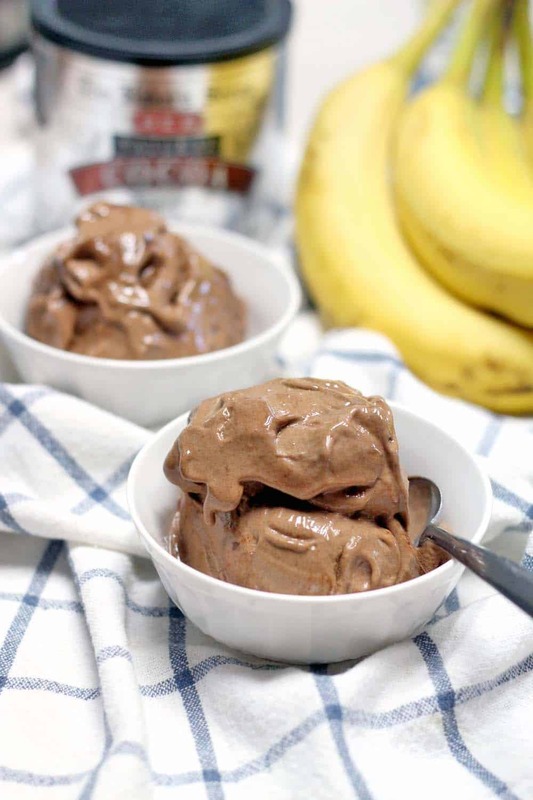 If so, you’re gonna love this simple chocolate ice cream that takes less than five minutes to come together! I wanted something light this afternoon to balance out the massive breakfast/brunch/lunch combo I had today. My friend mentioned making nice cream and with the new challenge, you know I had to spice up my normal vanilla and mint chocolate chip versions. So, without further ado, a light salted chocolate ice cream! Want to know a secret? I hated chocolate growing up. I honestly avoided it at nearly every cost until a few years ago. When I got to college, I started eating milk chocolate quite a bit and hated the bitter taste of dark chocolate. Now, it’s the opposite: I love dark chocolate and will rarely eat milk or white chocolate. I’ve actually branched out even more and use raw cacao to flavor my dishes. I use a lot of raw cacao in my dishes, because unlike regular chocolate, it’s loaded with healthy nutrients, minerals and antioxidants. When studies say that chocolate is good for you, this is the stuff they’re talking about. Add the banana, cacao powder, date and cinnamon to a food processor or high-speed blender. Let it go until the mixture is smooth and creamy, about 45 seconds. Sprinkle with sea salt and enjoy right away. If you’re using a high-speed food processor or blender, you can just split the banana in half. If your blender has a tougher time breaking down frozen goods, then slice the banana into small pieces. Place in a freezer-safe bag and let it freeze for at least 2 hours or overnight. Whenever we have bananas that are extra ripe, I throw them into a freezer-save bag, so we always have some on hand. I assume others do this also, which is why freezing time isn’t accounted for in the recipe. *For more from Lauren, visit Lauren Lives Healthy. Diversify Your Meal Palette With These 4th of July Recipes!